Prevent smoking initiation among youth. Increase access to tobacco cessation interventions. Why Address Smoking in Appalachia? Tobacco farming contributes to the history and identity of many Appalachian communities. Cultural norms may contribute to more frequent use of tobacco within the Region. As shown in the map above, adult smoking prevalence rates are disproportionately high throughout the Region, particularly across the Central and North Central subregions. These higher rates of smoking are driving more frequent occurrences of tobacco-related diseases, cutting the lives of many Appalachians far too short. The Creating a Culture of Health in Appalachia initiative has documented key health challenges and opportunities in Appalachia. The initiative’s reports offer a basis for understanding and addressing health issues in the Region and for identifying factors that support a culture of health in Appalachian communities. A striking portrait of tobacco’s impact on the lives of those who call Appalachia home emerged in these reports. Findings suggest that residents of Appalachia die sooner than residents in the rest of the United States and are more likely to die from smoking-related diseases. Smoking’s impact on health is well documented. Cigarette smoking causes more than 480,000 deaths each year in the United States, and remains a risk factor for a number of illnesses, including heart disease, respiratory disease, stroke, and cancer. The impact of smoking on the health of Appalachians is noteworthy. Residents of Appalachia are more likely to die prematurely than those who live in the non-Appalachian United States. Among those living in Central Appalachia and in economically distressed counties, those differences are even greater. While multiple factors contribute to these premature deaths, smoking remains a high-impact driver that underpins a greater loss of life in Appalachia than in the rest of the country. The above chart, which presents data from the Health Disparities in Appalachia report, shows that approximately 20% of Appalachian adults report being smokers compared to 16% of adults in the non-Appalachian United States. While rates of smoking are higher across all Appalachian subregions compared to the non-Appalachian United States, there are considerably higher proportions of smokers in the Central and North Central Appalachian subregions. The impact of smoking on the health and well-being of Appalachians is clear. Deaths from heart disease, cancer, and chronic lower respiratory disease—three of the four leading causes of death in the United States—occur more frequently in Appalachia than in the rest of the country. Smoking is a key factor contributing to deaths from these causes and is the primary driver of premature death and disability from chronic lower respiratory disease and chronic obstructive pulmonary disease (COPD). On average, Appalachians die from COPD at a rate that is 31% higher than the rate for residents in the rest of the country. The burden of COPD-related death in Central Appalachia is even more striking, with rates nearly twice that of the non-Appalachian United States. Economically distressed counties in Appalachia are also disproportionately burdened, with COPD mortality rates 43% higher than non-distressed counties across the Region. Notably, differences in COPD-related deaths within Appalachia are highest among those living in West Virginia and the Appalachian counties of Kentucky. While smoking is more common in these states, additional environmental stressors related to mine dust exposure may contribute to the markedly higher rates of COPD-related death. Because smoking and smoking-related diseases are particularly prevalent throughout Appalachia, understanding how and to what extent smoking affects one’s community is an important first step for determining how to target limited resources. Assessing community needs can help community leaders, funders, and policymakers determine which of the recommendations presented in this brief have the greatest potential to reduce smoking rates. Needs assessments are formative research activities that can help communities understand important cultural norms and attitudes that may affect tobacco prevention and cessation efforts. They can help community leaders, funders, and policymakers understand the prevalence and nature of tobacco use in a particular community, including which populations have high rates of tobacco use and how individuals are accessing it. Conducting a needs assessment will also help leaders take stock of which programs and policies are successfully addressing tobacco use or could be leveraged to do so. Quantitative data in conjunction with qualitative data from community forums and focus groups can show how changes have occurred over time and the barriers to creating change. Additional resources for conducting community needs assessments are provided on the next page. To target limited resources appropriately, community leaders, funders, and policymakers may consider leveraging data from state and national surveys to understand how tobacco use varies across counties. For example, in 2016 the West Virginia Division of Tobacco Prevention created a strategic plan for preventing tobacco use and promoting cessation using data from the national Behavioral Risk Factor Surveillance System (BRFSS) Survey and the West Virginia Youth Tobacco Survey (YTS) to illustrate tobacco use trends. For additional data, policymakers may also consider using County Health Rankings to understand how smoking rates vary by county. The Creating a Culture of Health in Appalachia initiative compiled data on 41 health indicators—including the prevalence of smoking—providing a comprehensive overview of health in the Appalachian Region. The Centers for Disease Control and Prevention’s State Tobacco Activities Tracking and Evaluation (STATE) System provides current and historical data on tobacco use prevention and control. It enables policymakers to view state highlights and interactive maps, and to build custom reports to explore a variety of historical and current data related to tobacco use policies and services. The annual State of Tobacco Control report evaluates state and federal government policies on tobacco use and provides a scorecard for each state on key areas related to preventing and reducing tobacco use. Based on the results of the community needs assessment, policymakers, funders, and community leaders should consider which recommendations and associated strategies described below are best suited for their communities. Many of the effective models for reducing tobacco use presented in this brief were part of multipronged efforts that combined community-based intervention with policy changes and health communications efforts. To successfully reduce tobacco use, community leaders, funders, and policymakers should work together to select a set of strategies that complement each other. Reducing the smoking rate in Appalachia could help decrease the number of tobacco-related deaths and diseases in the Region. In this section, we present policies, programs, and initiatives that show promise or have successfully reduced smoking rates. We also provide examples of intervention strategies that have been deployed in Appalachia. The majority of smokers begin using tobacco in adolescence. Because smoking is more common in Appalachia, adolescents are more likely to be surrounded by role models who use tobacco. Furthermore, tobacco industry messaging that targets rural communities coupled with a gap in antismoking campaigns in these areas contributes to a higher chance of early tobacco use. Both community- and policy-based strategies can help prevent tobacco use among adolescents in Appalachia. Decades of research have shown that school-based tobacco prevention and cessation programs can be effective in preventing and decreasing tobacco use among youth, particularly when combined with broader community initiatives. While the Centers for Disease Control and Prevention (CDC) provide key recommendations for preventing tobacco use that all schools can consider, schools in Appalachia can look toward the keepin’ it REAL adaptation in Pennsylvania and Ohio for an example of how to tailor prevention programs. The keepin’ it REAL (“REAL” is an acronym for Refuse, Explain, Avoid, and Leave) is an interactive curriculum used by the Drug Abuse Resistance Education (D.A.R.E.) program. In Pennsylvania and Ohio, keepin’ it REAL was adapted by interviewing 118 adolescents from rural school districts and was successful in reducing alcohol and drug use. Engaging youth in the program’s design ensured it reflected their perspectives and experiences. The success of the Students Against Destructive Decisions (SADD) program in Grant County, West Virginia—a Bright Spot community case study—indicates that student-led efforts are particularly successful in Appalachian communities. To replicate keepin’ it REAL, schools may consider connecting with local D.A.R.E. programs and involving students in tailoring the curriculum, similar to the rural adaptation of keepin’ it REAL. Educate parents, teachers, health professionals, and youth about the risks. Many adults are not aware of the risks associated with e-cigarette use and may view e-cigarettes as a safe alternative, a belief that is supported by e-cigarette marketing tactics. Schools, in particular, should increase education around the risks associated with e-cigarettes. The U.S. Surgeon General, in partnership with the CDC, provides fact sheets, tips for parents, and sample ads to communicate the risks of e-cigarettes. Restrict access. Policy strategies that have shown success in preventing tobacco use among youth show promise for reducing e-cigarette use. These include raising the minimum age of legal access (MLA) and increasing the price of e-cigarettes. Expand smoke-free policies. Many smoke-free policies were put in place before the rise of e-cigarettes and therefore do not prohibit their use. Smoke-free policies can be updated or developed to include bans on e-cigarette use. Community mobilization can be effective for reducing youth tobacco use when combined with other interventions. Mobilizing communities often begins with coalition building, which provides a platform for educating community members, supporting policy changes, and launching and amplifying mass-media campaigns. The Southern Coalfields Tobacco Prevention Network, a six-county coalition in rural West Virginia that promotes tobacco-free policies and conducts outreach to coal miners and pregnant women, exemplifies such a coalition. Forming a coalition is a key part of the Communities That Care model, which has shown success in reducing cigarette and smokeless tobacco among youth. The success of Tioga County, New York—a Bright Spot case study community—highlights how a strong sense of volunteerism can be instrumental in solving community challenges. Tioga County citizens have started a range of organizations that rely on volunteers to serve the community, including Reality Check, a youth tobacco-control project. Sequatchie County, Tennessee, another Bright Spot case study community, also mobilized volunteers to organize events that help people quit smoking through the program, Step Up Sequatchie: Improve Your Health One Step at a Time. Fostering and leveraging the pride that citizens demonstrate for their communities through volunteerism may be an important strategy for replicating these successes in other Appalachian communities. Minors frequently obtain cigarettes from their social networks. Raising the minimum age of legal access (MLA) to tobacco products to 21 has strong potential to reduce smoking among youth, because minors are less likely to share social networks with 21-year-olds compared to 18-year-olds. The Institute of Medicine states that increasing the MLA to tobacco products from 18 to 21 years of age will likely reduce the number of adolescents who begin using tobacco, lower smoking prevalence, and improve overall health. Current research supports focusing policy and law enforcement efforts on limiting the sale of tobacco to youth as opposed to penalizing youth for possession., Appalachian counties in New York have successfully increased the MLA of tobacco. For example, in April 2016 the Chautauqua County Legislature in New York increased the minimum age for tobacco sales to 21. Cattaraugus, Cortland, and Tompkins counties in Appalachian New York have also raised the MLA to 21. Some states have preemption laws limiting the ability of local governments to raise the MLA. Policymakers can use CDC’s STATE system to understand how preemption laws may impact their efforts to raise the MLA. Increasing the price of tobacco is an effective strategy for decreasing overall tobacco use, increasing cessation rates, and preventing initiation among youth. States and municipalities can designate tax revenue on tobacco products for public health programs, including cessation services.36 The Healthy Maryland Initiative was successful in working with the state legislature to raise taxes on cigarette packs and later on smokeless tobacco and little cigars. For counties considering how to implement this strategy, the Public Health Law Center provides resources on taxation and product pricing, preemption, and sales restrictions. Policymakers pursuing this option should consider strategies for increasing access to cessation support services, potentially by using revenue gained from increased taxes. The REAL prevention website includes a wealth of resources on the keepin’ it REAL program. CrimeSolutions.gov has a searchable database of school-based programs. Youth Tobacco Cessation: A Guide for Making Informed Decisions provides helpful guidance on selecting a program. Best Practices for Comprehensive Tobacco Control Programs User Guide describes key aspects of effective coalitions. The Tobacco Legal Consortium (TLC) provides a technical assistance guide with policy considerations for raising the MLA. TLC also offers a sample ordinance and a sample resolution for developing an MLA policy. The Tobacco21 “Healthy Towns, Healthy Kids” toolkit offers talking points on raising the MLA. Counties can also look at excise tax rates and rankings by state to see how their rates compare to others. The Campaign for Tobacco-Free Kids has numerous fact sheets that provide more information on state and federal tobacco taxes. Although evidence shows that cessation counseling effectively reduces cigarette use, individuals often struggle to access these services due to challenges with transportation, insurance coverage, and provider shortages. These challenges are particularly notable in many Appalachian communities with limited resources. Several strategies have emerged to increase access to cessation services and reduce barriers to participation. For many of the Bright Spot case study communities, active faith communities play an instrumental role in promoting community health by shaping attitudes, sharing information, and providing services. The Faith Moves Mountains smoking cessation program, which reached 590 smokers across 26 rural churches in Appalachian Kentucky, found that churches can facilitate smoking cessation by leveraging social connections among participants, providing a convenient location to access services, and helping individuals who might not otherwise be able to obtain cessation support gain access to these services. Faith-based organizations may take part in tobacco prevention and cessation efforts to varying extents. The Southern Coalfields Tobacco Prevention Network works with faith-based organizations to deliver tobacco cessation education, and sends cessation counselors to deliver food through their faith-based partner’s food delivery program, allowing these counselors to deliver brief interventions and refer individuals to services as they are delivering food. African American churches in western Georgia successfully used the CDC’s Community Health Assessment and Group Evaluation (CHANGE) action guide to develop a range of initiatives to address tobacco use, among other health issues. Quitlines are telephone- and web-based resources through which individuals can access tobacco cessation counseling. Quitlines are an effective way of increasing access to cessation programs, especially in areas with few local treatment options or for individuals with limited time or ability to travel to receive cessation services. Although they are typically implemented at the state level, community-based quitlines can be effective in referring callers to local resources, where available, and offering counseling tailored to address community-specific cultural factors. Important aspects of implementing successful quitlines include promoting programs through mass-reach health communication campaigns, linking callers to tobacco cessation medications, and ensuring a pathway to referral for health care providers. Resources for developing or enhancing telephone-based tobacco cessation services are available along with technical assistance from the North American Quitline Consortium. Quitlines are an example of telehealth, which involves the use of telecommunications technology to provide long-distance health care, education, and other wellness activities. Other forms of telehealth typically used for smoking cessation include mobile and web-based applications that can help users monitor their progress, identify triggers, and learn management techniques. For example, the National Institutes of Health offer a text-messaging program, SmokefreeTXT, and two smartphone applications, QuitGuide and quitSTART, which can provide tailored quit plans for users. One smoking cessation program in Appalachian Kentucky and Ohio used a web-based application called Motiv8 that collected carbon monoxide breath samples and provided incentives for reduced smoking. Reducing out-of-pocket costs for evidence-based cessation counseling and medications is an effective way of increasing the number of individuals who receive treatment for tobacco dependence and ultimately quit. Although almost all insurers are required to cover some level of tobacco cessation services without cost-sharing, this coverage may not be comprehensive. Only a limited number of state Medicaid programs provide coverage for all FDA-recommended medications and counseling. Making additional benefits available and clearly communicating them to providers and tobacco users can increase use of these services. To understand how this issue affects their communities, policymakers can consult the American Lung Association’s database and the CDC’s STATE System on smoking cessation coverage. Policymakers can also look to Kentucky as an example for expanding treatment coverage; the Kentucky state legislature recently passed Senate Bill 89, expanding coverage to include all tobacco cessation services recommended by the U.S. Preventive Services Task Force. Engaging and Partnering with Faith-Based Organizations in Initiatives for Children, Youth, and Families is intended for community organizations seeking to partner with faith-based organizations. Partnerships with Faith-Based & Community-Based Organizations: Engaging America’s Grassroots Organizations in Promoting Public Health describes successful strategies that the CDC has used with faith-based organizations on public health issues. Telephone Quitlines: A Resource for Development, Implementation, and Evaluation provides more information on setting up a telephone-based quitline. Telehealth as a Vehicle to Support Tobacco Cessation gives an overview of considerations for counties seeking to employ cessation services via telehealth. Reimbursement for Smoking Cessation Therapy: A Healthcare Practitioner’s Guide, 3rd Edition includes information on tobacco cessation treatments and reimbursement. This Case Study on the Effect of Cessation Coverage—The Massachusetts Medicaid Cessation Benefit may serve as a useful example. Mass-reach anti-tobacco communication efforts have been effective in reducing tobacco use initiation and increasing tobacco cessation, particularly among youth who are more likely to be impacted by pro-tobacco marketing, and can include a broad range of themes. Key considerations for launching anti-tobacco communication interventions include identifying messages that will resonate with the target audience and communication channels that will best reach community members. Anti-tobacco media campaigns can be used to complement other strategies recommended in this brief. For example, the Spit It Out West Virginia program implemented mass-reach communication efforts, offered educational interventions, campaigned for smoke-free policies, and engaged with faith-based organizations. Communication efforts included billboards and hundreds of radio ads that aired during hunting season on local stations, and anti-smoking handouts given with bank statements from local banks. 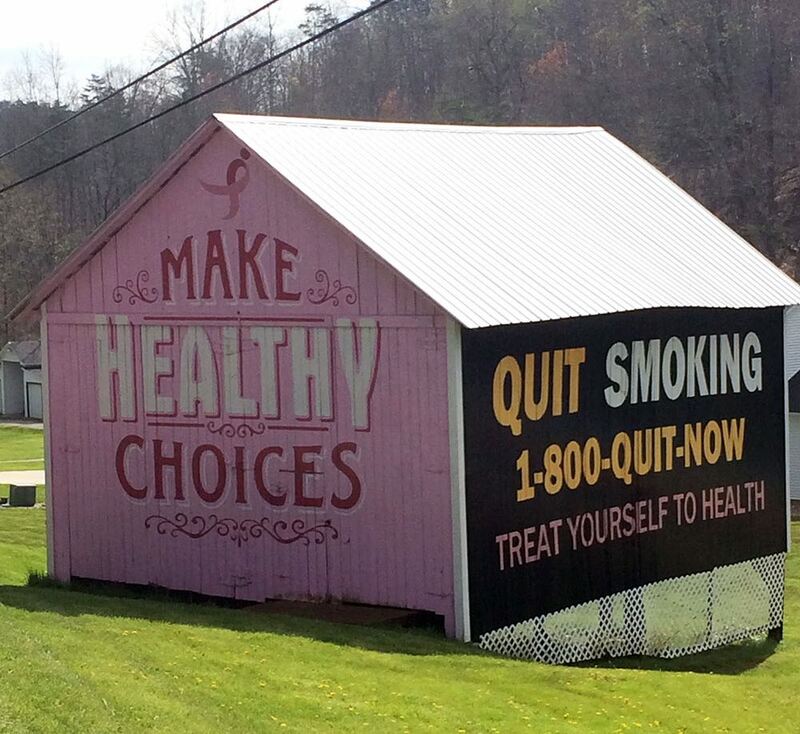 Wirt County, West Virginia—a Bright Spot case study community—also executed a successful anti-tobacco health messaging campaign in the form of the “Tobacco Prevention Barn,” pictured here. Stakeholders seeking to kick-start similar mass-reach communication campaigns can use the W.K. Kellogg Foundation’s Strategic Communications Plan Template and CDC’s Tips from Former Smokers Campaign Materials, in addition to the other materials described below. This Communication Toolkit details strategies that rural healthcare facilities can use to communicate with the media. The Implementing a Social Marketing Effort toolbox has resources for launching marketing initiatives centered on healthy living. Framing 101 includes considerations on public health messaging. Media Advocacy 101 is a primer on using mass media to address public health issues. Smoke-free policies have been strongly linked to reductions in secondhand smoke exposure, heart attacks, asthma attacks, sudden infant death syndrome, and low birth weight infants. Appalachian communities in tobacco-producing regions may be opposed to smoke-free policies because of their potential effect on the local economy. A presentation by the University of Kentucky discusses strategies for addressing concerns in rural, tobacco-growing regions of Kentucky. Although smoke-free policies are commonly enacted by state and local governments, local businesses and stakeholders can be instrumental in enforcing government policies and voluntarily adopting their smoke-free policies. For example, community leaders in McCreary County, Kentucky—a Bright Spot case study community—engaged with work sites and restaurants to voluntarily establish smoke-free policies. Bright Spot case study community, Tioga County, New York, also pushed for an increase in smoke-free spaces by leveraging community-wide interest in improving the well-being of youth. Stakeholders seeking to implement or expand smoke-free policies should consider the extent to which state laws preempt local laws, and how these policies may be enforced and promoted. Similar to other strategies presented in this brief, implementing or expanding smoke-free policies should be considered alongside other strategies, such as media campaigns that promote awareness of these policies and increased access to cessation services in order to promote compliance with these policies. Resources are available for stakeholders considering working with schools, businesses, healthcare facilities, and multifamily housing units to introduce smoke-free policies. Americans for Nonsmokers’ Rights also provides an array of resources for implementing smoke-free policies in communities. Smoke-Free Laws Do Not Harm Business at Restaurants and Bars provides evidence and examples showing that smoke-free laws improve public health without harming businesses. Smoke-Free Multifamily Housing Toolkits provide information and resources that can help managers and residents of public and assisted multifamily housing improve the safety of their homes. Smoke-Free Housing Resources includes information on creating and implementing regulations on smoke-free housing. Smoke-Free Policies: Establishing a Smoke-Free Ordinance to Reduce Exposure to Secondhand Smoke in Indoor Worksites and Public Places—An Action Guide describes how to develop smoke-free ordinances for indoor worksites and public spaces. Tobacco in the Workplace: A Model Policy offers steps for developing and implementing smoke-free policies in the workplace. Treating Tobacco Dependence as a Standard of Care: A Health Systems Approach provides steps for implementing smoke-free policies in healthcare settings. Funders throughout the Region have the opportunity to invest in initiatives and activities that help prevent and reduce smoking and tobacco use across Appalachia. Below, we describe strategies for funders seeking to reduce smoking-related health disparities in the Appalachian Region. Appalachian communities have many assets that should be recognized and promoted. These include strong communities with members who are connected through volunteering and coalition building, and who build strong social ties through faith- and community-based organizations, schools, local business, and shared culture and history. Funders can leverage existing programs, practices, and policies by highlighting the work of Appalachian grantees. Additionally, existing Appalachian work can be disseminated and shared to stimulate replication and adoption of programs and strategies elsewhere. Funders can strengthen community implementation capacity in Appalachian communities. Opportunities to increase capacity include 1) enhancing individual-level knowledge and skills that facilitate community action, and 2) fostering organizational- and systems-level capacity. Examples of organizational- and systems-level capacity include engaging in community visioning and strategic planning, building networks and engaging community stakeholders, writing grants, and engaging in local and regional policy advocacy, among others. Funders can help facilitate collaboration between community members, the public, and private-sector individuals, which is critical to addressing tobacco use and smoking within the Region. Through a coordinated use of resources, leadership, and action, communities can work together toward a common goal, using multiple perspectives and different areas of expertise. Government, the health care system, schools, private businesses, and community organizations all have critical roles in this effort. The Bright Spot case studies identified examples of promising practices to address smoking in Appalachian communities. However, these programs and their outcomes are often not well documented. For long-term changes to occur, successful programs need to be evaluated rigorously and shared widely. Funders should encourage evaluation among their grantees, to ensure program effectiveness is measured and documented. Evaluation, along with increased efforts to document local successes, will provide a more robust evidence-base for specific Appalachian programs and policies to address smoking and tobacco control. Office on Smoking and Health, Centers for Disease Control and Prevention. (2017). Smoking and tobacco use: Fast facts and fact sheets. Retrieved from: https://www.cdc.gov/tobacco/data_statistics/fact_sheets/index.htm. Rural Health Information Hub. (n.d.). Formative research and needs assessments. Retrieved from: https://www.ruralhealthinfo.org/toolkits/tobacco/4/research-and-needs-assessments. Morain, S. R., Winickoff, J. P., & Mello, M. M. (2016). Have tobacco 21 laws come of age? New England Journal of Medicine, 374(17), 1601-1604. doi:10.1056/nejmp1603294. American Lung Association. Cutting tobacco’s rural roots: Tobacco use in rural communities. (n.d.). Retrieved from: http://www.lung.org/assets/documents/research/cutting-tobaccos-rural-roots.pdf. U.S. Department of Health and Human Services (2012). Chapter six: Efforts to prevent and reduce tobacco use among young people. Retrieved from: https://www.surgeongeneral.gov/library/reports/preventing-youth-tobacco-use/sgr_chapt6.pdf. Pettigrew, J., Graham, J. W., Miller-Day, M., Hecht, M. L., Krieger, J. L., & Shin, Y. J. (2015). Adherence and delivery: Implementation quality and program outcomes for the seventh-grade keepin’ it REAL program. Prevention Science Journal, 16(1), 90-9. Rural Health Information Hub. (n.d.). Keepin’ it REAL rural. Retrieved from: https://www.ruralhealthinfo.org/project-examples/872. Wang, T. W., Gentzke, A., Sharapova, S., Cullen, K. A., Ambrose, B. K., & Jamal, A. (2018). Tobacco product use among middle and high school students – United States, 2011–2017. Morbidity and Mortality Weekly Report, 67, 629–633. doi: http://dx.doi.org/10.15585/mmwr.mm6722a3. Owusu, D., Aibangbee, J., Collins, C., Robertson, C., Wang, L., Littleton, M. A., et al. (2016). The use of e-cigarettes among school-going adolescents in a predominantly rural environment of Central Appalachia. Journal of Community Health, 42 (3), 624-631. doi:10.1007/s10900-016-0297-0. U.S. Department of Health and Human Services. (2016). E-cigarette use among youth and young adults: A report of the surgeon general. Retrieved from: https://e-cigarettes.surgeongeneral.gov/documents/2016_SGR_Exec_Summ_508.pdf. Winickoff, J. P., & Winickoff, S. E. (2016). Potential solutions to electronic cigarette use among adolescents. Pediatrics, 138(2). doi:10.1542/peds.2016-1502. The Community Guide. (2018). Tobacco use and secondhand smoke exposure: Community mobilization with additional interventions to restrict minors’ access to tobacco products. Retrieved from: https://www.thecommunityguide.org/findings/tobacco-use-and-secondhand-smoke-exposure-community-mobilization-additional-interventions. Institute of Medicine. (2015). Public health implications of raising the minimum age of legal access to tobacco products. Retrieved from: https://www.nap.edu/read/18997/chapter/1. Tobacco Free Kids. (2018). PUP laws are not proven to reduce tobacco use. Retrieved from: https://www.tobaccofreekids.org/assets/factsheets/0074.pdf. Wakefield, M. (2003). Teen penalties for tobacco possession, use, and purchase: Evidence and issues. Tobacco Control, 12(90001), 6i-13. doi:10.1136/tc.12.suppl_1.i6. New York Department of Health. (n.d.). Tobacco control policies in NYS. Retrieved from: https://www.health.ny.gov/prevention/tobacco_control/current_policies.htm. The Community Guide. (2012). Tobacco use and secondhand smoke exposure: Interventions to increase the unit price for tobacco products. Retrieved from: https://www.thecommunityguide.org/findings/tobacco-use-and-secondhand-smoke-exposure-interventions-increase-unit-price-tobacco. Healthcare for All. (2019). New campaign! Healthy Maryland initiative. Retrieved from: http://healthcareforall.com/new-campaign-healthy-maryland-initiative/. The Community Guide. (2012). Tobacco use and secondhand smoke exposure: Interventions to increase the unit price for tobacco products. Centers for Disease Control and Prevention. (2018). NCCDPHP: Community health. Retrieved from: https://www.cdc.gov/nccdphp/dch/programs/healthycommunitiesprogram/tools/change/downloads.htm. Centers for Disease Control and Prevention. (2017). NCCDPHP success story: African American churches in West Georgia promote health and self-care. Retrieved January 31, 2019, from: https://nccd.cdc.gov/nccdsuccessstories/TemplateSeven.aspx?s=12522&ds=1. The Community Guide. (2018). Tobacco use and secondhand smoke exposure: Quitline interventions. Retrieved from: https://www.thecommunityguide.org/findings/tobacco-use-and-secondhand-smoke-exposure-quitline-interventions. Rural Health Information Hub. (2018). Quitline interventions. Retrieved from: https://www.ruralhealthinfo.org/. The Community Guide. (2018). Tobacco use and secondhand smoke exposure: Quitline interventions. Virginia Joint Commission for Health Care. (2018). Retrieved from: http://jchc.virginia.gov/3.%20Options%20for%20Increasing%20the%20use%20of%20telemental%20health.pdf. The Community Guide. (2018). Tobacco use and secondhand smoke exposure: Reducing out-of-pocket costs for evidence-based cessation treatments. Retrieved from: https://www.thecommunityguide.org/findings/tobacco-use-and-secondhand-smoke-exposure-reducing-out-pocket-costs-evidence-based-cessation. American Lung Association. (2019). Tobacco cessation treatment: What is covered? Retrieved from: https://www.lung.org/our-initiatives/tobacco/cessation-and-prevention/tobacco-cessation-treatment-what-is-covered.html. Di Giulio, A., Jump, Z., Yu, A., Babb, S., Schecter, A., Williams, K-A., et al. (2018). State Medicaid coverage for tobacco cessation treatments and barriers to accessing treatments United States, 2015–2017. Morbidity and Mortality Weekly Report, 67(13), 390-395. Retrieved from: https://www.cdc.gov/mmwr/volumes/67/wr/mm6713a3.htm. The Community Guide. (2018). Tobacco use and secondhand smoke exposure: Reducing out-of-pocket costs for evidence-based cessation treatments. The Community Guide. (2018). Tobacco use and secondhand smoke exposure: Mass-reach health communication. Retrieved from: https://www.thecommunityguide.org/findings/tobacco-use-and-secondhand-smoke-exposure-mass-reach-health-communication-interventions. National Center for Chronic Disease Prevention and Health Promotion (U.S.) Office on Smoking and Health. (2012). Preventing tobacco use among youth and young adults: A report of the surgeon general. Retrieved from: https://www.ncbi.nlm.nih.gov/books/NBK99237/. Rural Health Information Hub. (n.d.). Mass-reach health communication interventions. Retrieved from: https://www.ruralhealthinfo.org/. The Community Guide. (2018). Tobacco use and secondhand smoke exposure: Smoke-free policies. Retrieved from: https://www.thecommunityguide.org/findings/tobacco-use-and-secondhand-smoke-exposure-smoke-free-policies. Rural Health Information Hub. (2018). Mass-reach health communication interventions. Retrieved from: https://www.ruralhealthinfo.org/.